Get in and out without getting wet The Monstleo Inverted Umbrella, with its reverse opening mechanism, opens outdoors while you're still indoors or inside of your car. This practical configuration ensures that you stay dry and look impeccable even after walking from the parking lot to make that important business pitch. When you reach your destination and close the Monstleo, rain collects inside and keeps the foyer dry. We turned the traditional rain umbrella upside-down The Monstleo Inverted Umbrella doesn't protect just you from Mother Nature's wrath. Its' inside out design closes to form a waterproof cone, collecting precipitation to keep floors and car interiors dry. Because this reverse umbrella opens from the top rather than from the bottom, it is also reduces the risk of poking passers-by, making it a considerate travel and car umbrella. Every Monstleo Windproof Umbrella comes with its own shoulder-sling pouch for easy carry on cloudy days. Convenient and reliable Our upside down umbrella boasts 6 sturdy carbon fiber ribs and stretchers, giving it unparalleled resistance to winds in excess of 60 mph. The canopy umbrella windproof, waterproof and UV protective. Because it spans a generous 42.5", there's room for you and a friend. The ergonomic C-shaped handle gives you hands-free use of our inside out umbrella so you can carry groceries, walk your dog or respond to text messages with ease. With 20 stylish motifs to choose from, you can tailor your reversible umbrella to your personality. Don't let a little rain dampen your spirits. 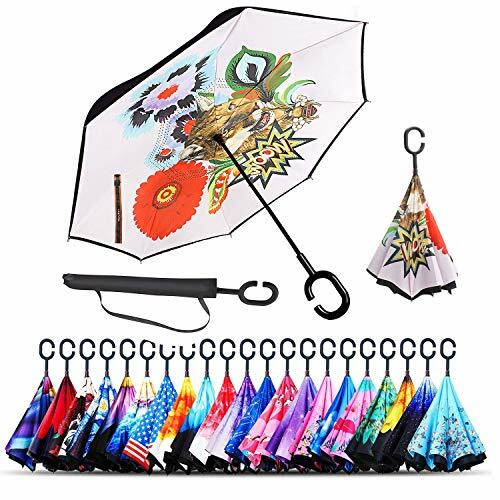 Add one of our chic Sharpty Inverted Umbrellas for Women to your cart today.